June is such a great month for weddings. Think summer brides with handsome grooms, and beautiful outdoor ceremonies and receptions. I especially love the tradition of the first dance the happy couple shares together as husband and wife. During a recent author interview, I was asked to provide my “Top Ten Wedding Songs” and I had a blast coming up with my list. I visited wedding planning websites and hunted online, finding audio samples of tunes along the way. Finally, I settled on my favorites. While I didn’t have dancing at my wedding (hubby and I eloped! ), if I was asked to select a romantic song for a very special dance today, I would definitely pick one of these. Do you see any of your favorites? If you have another choice that’s not here, please feel free to add it below. In celebration of summer love, I’ll award a free e-book copy of A Summer Grooms Selection (Books 1 – 3) to one person who comments by Sunday at midnight. New York Times and USA Today Bestselling Author Ginny Baird writes contemporary romance novels and novellas. Her newest sweet romance release is My Best Friend’s Bride, now available at Amazon, iBooks, Kobo and B&N. Want to keep up with news from Sweet Romance Reads authors? Sign up for the SRR newsletter today. Like chatting about Sweet Romance? Join the authors of Sweet Romance Reads in our cyber Café! That's a great one, Kathleen! My daughter and son-in-law used The Reason by Hoobastank. I can't listen to it without tearing up now. From This Moment, Shania Twain. Actually, I think the duet version may be my favorite. I agree about the duet version. Very moving. Thanks, Alieen, Barbara and Julie for your additions! All great, romantic songs! I know, Rhonda. That song always gets to me. So beautiful! Oh cool! Sounds like a classic! A beautiful song, and a very popular one at weddings! I don't want to miss a thing...I love that song. Thanks to all for commenting! 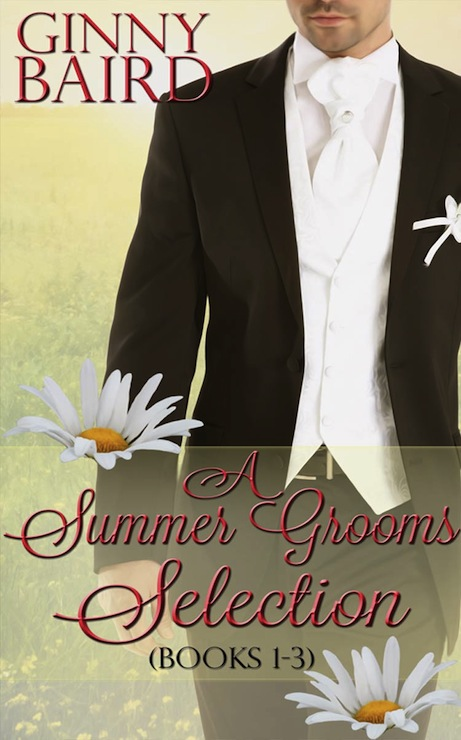 Congratulations to Barbara Eward for winning a free ebook copy of A Summer Grooms Selection (Books 1 - 3). Barbara, please contact me at ginnybairdromance *at* gmail *dot* com to collect your prize. https://www.google.com/url?sa=t&source=web&rct=j&ei=NV6RVby0I8q1-AHCoIGgDg&url=http://www.youtube.com/watch%3Fv%3DsJxSMcrVaSI&ved=0CB8QyCkwAA&usg=AFQjCNEO-JQAqSMs3K3EJ9NFhTtQEEeNeg This was my song. By Diamond Rio. I was meant to be with you. Diamond Rio's a great band!